Gone are the days when a projector needed to sit across the room from the wall. Now, they can get closer than ever. In fact, some can work from just inches away. Of course, there’s plenty of room on the market for projectors like BenQ TK800 that require more space, but it’s nice to see the field evolving. 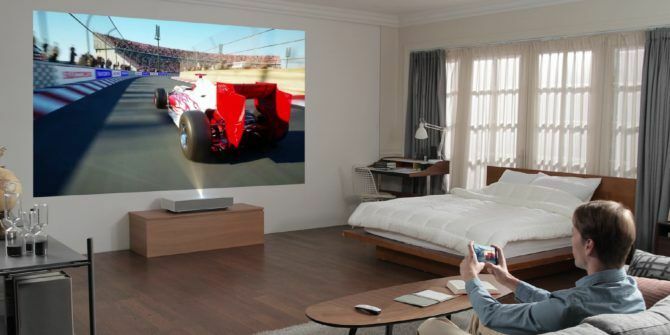 LG has just revealed a shockingly impressive projector that actually sits just inches from the wall on which it’ll display the screen. In fact, at just two-inches from the wall, the new projector in LG’s CineBeam can project a 90-inch screen. And for anyone who thinks 90-inches of screen real estate isn’t enough, moving the CineBeam HU85L laser projector back to just seven-inches away yields a massive 120-inch screen. As mentioned, the main thing that makes this particular projector stand out from the crowd is how close it can be to the wall. LG calls the technology that allows this to work “Ultra Short Throw (UST).” This is great because it allows the projector to be used in small rooms where moving it a few feet back just isn’t an option. It also allows for a cleaner aesthetic, since there doesn’t need to be a bulky projector hanging from the ceiling and wires running from the projector to the input devices. Another thing that makes this projector worth a second look is its support of 4K resolution. Not only will it project from an incredibly short distance, but it’ll project an extremely high-quality picture. The device outputs 2,500 ANSI lumens of brightness. To put that into perspective, the LG HF85JA featured an output of 1,500 ANSI lumens, so this year’s model promises to be quite a bit brighter. For connections, the CineBeam HU85L features USB, HDMI, and Ethernet ports. It also includes LG’s ThinQ AI for voice commands, which should make navigating around the projector much more pleasant. It has the same functions as a smart TV, so it’ll run all of the streaming apps and other services users expect from a high-end device. When Will the CineBeam Hu85L Launch? Unfortunately, when LG announced the new projector, it didn’t say when it would be available and for how much. However, we’re only a couple of weeks away from CES, which is when we’d expect LG to provide the rest of the information. In the meantime, if you need a projector right now, make sure to check out our review of the P1 Mini Projector Small in Size, Big on Features: P1 Mini Projector Review (and Giveaway) Small in Size, Big on Features: P1 Mini Projector Review (and Giveaway) Read More .